Success for Germany’s Patrick Franziska and the Korea Republic’s Jeong Sangeun was the order of proceedings on Wednesday 7th November in Linz. 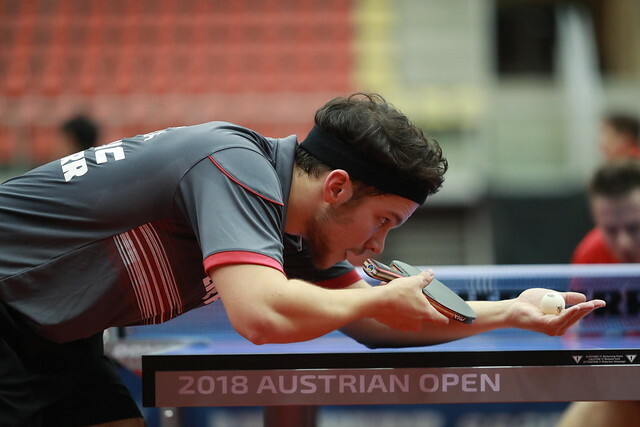 They are the leading names in the top half of the draw in the Men’s Singles qualification tournament at the Seamaster 2018 ITTF World Tour Platinum Liebherr Austrian Open. In the third preliminary round, Patrick Franziska beat Hong Kong’s Ng Pak Nam (11-9, 11-7, 11-8, 11-7), Jeong Sangeun accounted for Slovenia’s Darko Jorgic (11-6, 14-12, 12-10, 6-11, 10-12, 3-11, 11-7). However, there were surprises, the one to delight the home supporters being the win recorded by Stefan Fegerl in opposition to Japan’s Yuya Oshima. Listed at no.67 on the current Men’s World Rankings, Stefan Fegerl beat Yuya Oshima, named at no.29 by the very narrowest of seven games margins (9-11, 11-4, 11-5, 11-4, 5-11, 12-14, 15-13). Defeat for Yuya Oshima, a defeat that could affect his chances of qualification for the US$ 1,000,000 Seamaster 2018 ITTF World Tour Grand Finals to be staged in December in Incheon. Presently, he is listed at no.15 on the Standings (349 points). The players on duty in Linz who could well overtake him are colleagues Koki Niwa and Kazuhiro Yoshimura, alongside Portugal’s Marcos Freitas and Germany’s Timo Boll. Direct entries to the main draw, Koki Niwas occupies the no.16 spot (288 points), Marcos Freitas is in 20th place (264 points), ahead of Timo Boll in 21st position (263 points). Also, in the equation is Japan’s Kazuhiro Yoshimura, he is listed at no.19 (266 points); in the second preliminary round, he beat Kazakhstan’s Kirill Gerassimenko (12-14, 11-9, 11-8, 13-15, 11-8, 11-7). Hopes of a place in the Grand Finals now in doubt for Yuya Oshima, for Denmark’s Jonathan Groth, listed at no.28 (196 points) and Kenta Matsudaira, named at no.23 (239 points), both leading names in the preliminary stage, their aspirations are over. Both suffered at the hands of hungry Chinese aspirants; Jonathan Groth was beaten by Liang Jingkun (11-8, 11-9, 11-6, 7-11, 11-6), Kenta Matsudaira suffered when facing Liu Dingshuo (11-7, 12-10, 11-7, 11-7). Liang Jingkun, listed at no.8 on the Standings (447 point) is assured a place in the Grand Finals, Liu Dingshuo is not certain, he is at no.14 (371 points) but with the demise of Yuya Oshima he is ever closer. Disappointment for Japan but there was notable success, Maharu Yoshimura accounted for DPR Korea’s An Ji Song in a tense seven games contest (10-12, 7-11, 16-14, 11-9, 11-5, 9-11, 12-10). Progress for promising young players, there was also progress in the top half of the draw for a player who fitted that bill a quarter of a century ago; Vladimir Samsonov of Belarus accounted for Sweden’s Jon Persson (11-6, 4-11, 11-7, 16-14, 6-11, 5-11, 11-5). The fourth preliminary round, the round to decide places in the main draw, concludes later in the evening.